While the “gig economy” – that buzzword of the late-2010s – has nothing to do with live rock’n’roll, that’s not stopped the entrepreneurs behind this new way of working from borrowing the music industry’s anti-establishment vibe to sell their story. The gig economy has certainly become a cultural phenomenon as increasing numbers of independent contractors work on jobs assigned via a digital platform. About 2.5 million Australians are now employed on a casual basis, according to The Australian Bureau of Statistics. That’s more than a quarter of the workforce, up from 13 per cent in 1990s. There are no national numbers on how many of these workers are dancing between the gig platforms – driving people for Uber or Taxify, walking their dog for them via Airtasker, or cycling them dinner via Deliveroo, Foodora or Uber Eats – but Unions NSW has estimated such work adds $504 million to its home state’s economy annually and provides income for 45,000 residents. But where rock’n’roll was about sticking it to “the man”, it is the middle man who will be the victim of the gig economy. At the top end of the employment market, this might mean retrenched chief executives or burned-out professionals can find new lives as guns for hire, thanks to online marketplaces such as Expert360 or Commtract. 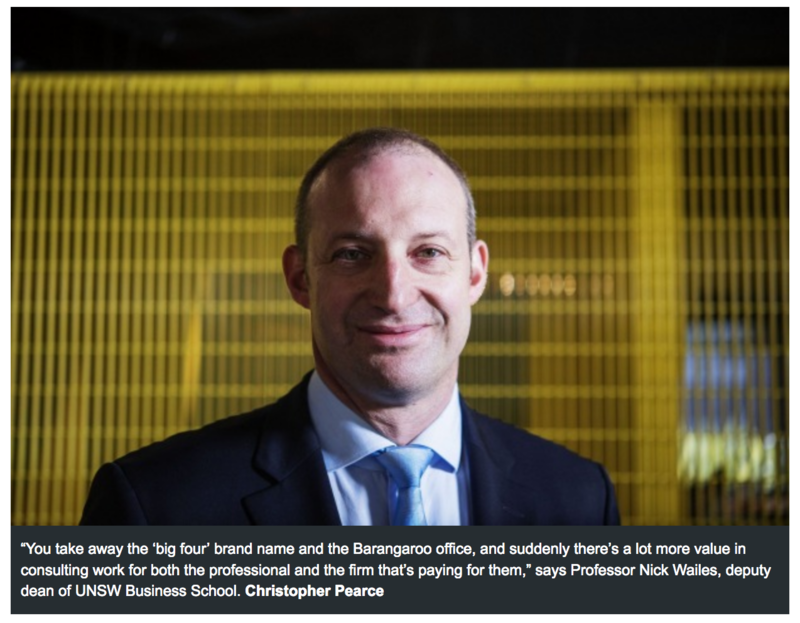 “You take away the ‘big four’ brand name and the Barangaroo office, and suddenly there’s a lot more value in consulting work for both the professional and the firm that’s paying for them,” says Professor Nick Wailes, deputy dean of UNSW Business School. It’s not only white-collar workers who can benefit from these gig platforms. 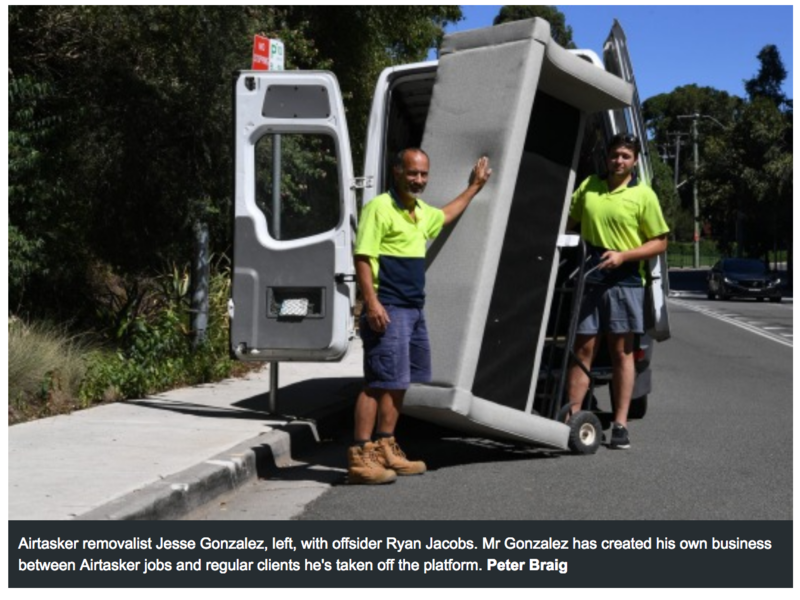 Jesse Gonzalez was a contractor to courier Startrack Express for 20 years and ran a taxi for the next seven; he told Fairfax that the past 30 months spent hunting for removalist work on Airtasker were “the best thing ever”. Gonzalez grossed $98,000 on Airtasker in 2017, out of which he had to pay an offsider, the running costs of the van he bought with his taxi plate proceeds and the platform’s 15 per cent commission. However, he grossed almost a further $100,000 last year from customers who had originally engaged him through Airtasker, but now hired him directly. Airtasker chief executive Tim Fung takes a suitably rock’n’roll attitude to being blatantly cut out of the action. “Freedom and flexibility are two of the biggest attractions for our community and we’re not going to get in the way of that,” he says. Airtasker is trying to positively discourage its own disintermediation. In April, it introduced a sliding commission scale, which goes as low as 4 per cent for repeat transactions or high-value jobs, and bought a personal accident insurance policy to cover all tasks transacted through the platform. It’s not the only gig economy giant to throw sweeteners at its workforce of independent contractors. Uber Australia is rolling out a new app that claims to dynamically direct its 80,000 drivers to the areas with highest earning opportunities, following a study that showed most of them are still clearing below the national minimum wage of $18.29 an hour. Of course most taxi drivers were low paid before Uber came along. In addition to paying for fuel, they usually had to work off a daily buy-in imposed by the owner of their licence plate before they could make any profit. But such history doesn’t mask the fact the gig platforms are allowing secure employment to be reduced at an unprecedented rate, says Associate Professor Angela Knox of the University of Sydney Business School. “Businesses are increasingly opting out of contracts of employment, because employment regulation takes wages out of competition, but the gig economy puts them back in play and allows a race to the bottom, that we are already seeing,” she says. A Senate inquiry into corporate avoidance of the Fair Work Act concluded last year that most gig workers were not lawfully independent contractors, given most platforms asserted employer-like control over their lives, for instance charging them a commission to use their apps, and making them dependent on ratings within the app to win new work. The British government has already said it would enshrine a new class of “dependent contractors” between fully employed and self-employed workers. Professor Knox predicts Australia’s government will follow suit. “I think we’ll see something which looks like casual employment, with loadings to compensate for foregone rights like sick leave, fitted over the gig economy,” she says. The platforms are still early in their evolution, and might eventually become complex networks that created economic growth and sustain higher pay, he says. “Look at Uber. It started out clipping the ticket on a lift in your car, now it’s at the centre of an ecosystem where through Uber Eats it’s growing restaurants, it’s spawned new businesses leasing cars to drivers, it’s sharing traffic data with authorities,” he says.